Writer Chris Roberson (iZombie, Witchfinder), artist Tony Parker (Mayday, This Damned Band), colorist Dan Jackson (Buffy the Vampire Slayer, Disney•Pixar’s Incredibles 2: Crisis in Mid-Life! & Other Stories), and letterer John Roshell of Comicraft set out to explore whether Kratos, the God of War, will ever find a peace in a world of violence. The beautiful cover art is by artist E.M. Gist (The Strain, Will Save The Galaxy for Food). 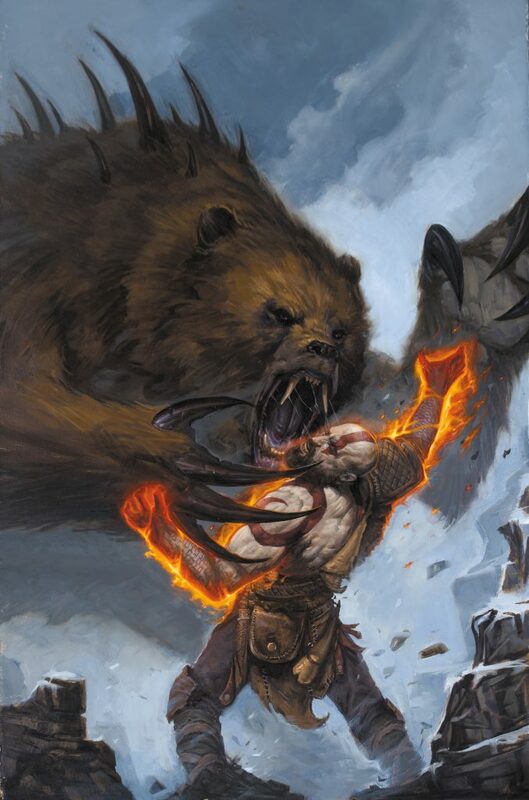 The God of War comic series finds Kratos living in the remote Norse wilds after his war on the gods of Olympus. Seeking to put the rage that defined most of his life behind him, Kratos inadvertently sparks a feud with a mysterious cult of berserkers after attempting to save a stranger being mauled by a monstrous bear. But for the former Ghost of Sparta, no good deed goes unpunished. God of War #1 goes on sale November 14, 2018, and will soon be available for pre-order at your local comic shop.